The world of social media is always turning. You may use Facebook to keep up with friends. Alternatively, you might utilize Twitter to promote your business. You may even be searching on LinkedIn to find a new job. No matter the case, social media is constantly evolving. Social media trends seem to change every day. App updates, interface overhauls, and new features roll out every single week. With multiple social media channels and a myriad of ever-evolving trends, it can be hard to keep up. Here at Emergent Digital, we use the power of social media to help brands grow and thrive online. To reach new customers and spread your message, social media is one of the best methods for reaching out in the digital age. We like to keep ahead of the social media curve, so here are our top stories and social media trends from the past week. Facebook is undoubtedly the most powerful social media entity in the world. In fact, many could argue that Mark Zuckerberg is the inceptor of the social media world itself. As Facebook’s features continually grow and shape the way we interact daily, they are making a serious push into the competitive employment and business space online. Facebook Jobs is a new way to post jobs and submit applications on the largest social media channel in the world. What’s more interesting is that this service is completely free, targeting small and medium size businesses. This is in stark contrast to LinkedIn, which only allows businesses to post job offerings for a fee on their social employment platform. With trademark Facebook usability, free cost, and largest active user base on the planet, LinkedIn could be in serious trouble. 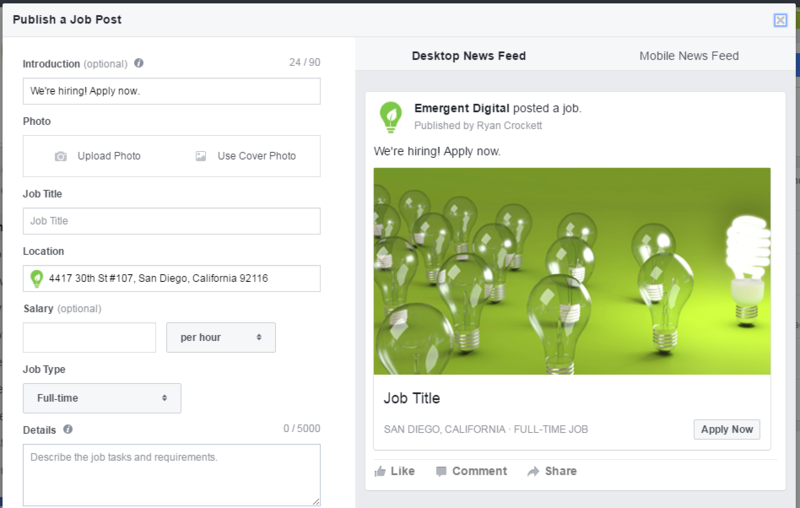 You can now create a job post directly from your Facebook business page. This pre-filled form makes it easy and fast to apply for jobs in a minimal amount of time. Job-seekers can search by job title, field of expertise, and location with a very accurate and easy to use search interface. Watch out LinkedIn, Facebook is coming for you. Instagram has been rolling out a massive wealth of new features in recent months. One notable example is that Instagram Live is taking over the live-streaming space previously dominated by Snapchat. The Instagram interface is becoming more complex every day. Furthermore, they’re showing no signs of slowing down. In a recent blog post, Instagram announced the ability to share up to 10 photos or videos in a single post. This is bringing a new level of storytelling to the application. These new multi-photo posts look nearly identical to posts of the past, save for a row of tiny dots toward the bottom of the visual. There’s a ton of functionality in the new posting interface. This includes the ability to easily change the order of photos or videos, then edit them individually or all at once. Instagram’s popularity has often been attributed to a highly visual and easy to use mobile interface. In the same vein, this new feature seems remarkably easy to use. Pinterest has always been an underrated social media platform, rising to popularity with a highly female demographic that’s become mainstream only recently. However, there’s a lot of opportunity in the platform for social media marketers, as 97% of Pinterest’s search queries don’t mention a specific brand. With Pinterest users in constant open discovery mode, there’s an even playing field for new brands and products. This has been augmented by Pinterest’s new visual search tool, and entirely new way to discover on the social channel. Users can now zoom in on a particular area of a Pin with the click of a button. The seamless interface then displays a myriad of Pins similar to the section of the photo that’s been highlighted. This will add a massive wealth of functionality to the discovery search platform. This social media trend may leak into other social channels like Facebook and Instagram. As a result, this could reveal a new era of visual search on social networks. What are you favorite social media trends this week? Please let us know with a comment below! If you would like help growing your presence on social media, please contact Emergent Digital today.